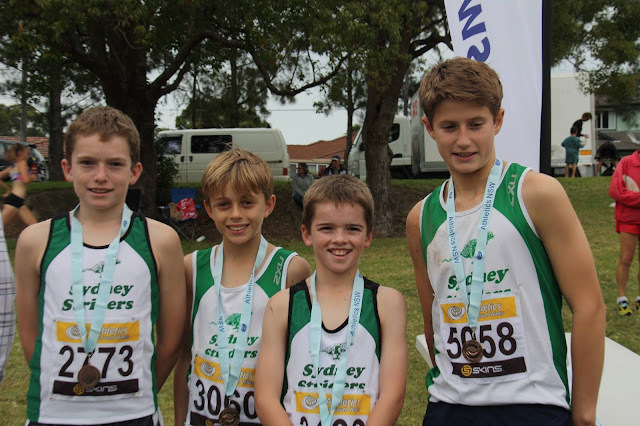 What better way to spend a cold and rainy first day of winter than at the Miranda Cross Country Relays running in a Sydney Striders team in the green and white! This event is a very competitive event and we did well to come home with five bronze team medals ( under 12 boys, under 12 girls, under 14 boys, under 16 boys, under 20 girls) and one silver (under 18 boys). We also had an under 14 girls team which came 5th, but there were just a few seconds between 3rd, 4th and 5th. We had two B teams - under 12 boys and under 18 boys - which ran well too. We have a lot of runners in the first year of their two year age band this year, and we had a few very last minute drop outs in the under 12s and under 14s to deal with too. So, taking these things into consideration, we achieved some very good results indeed. Special thanks to Emily Gocher, Kieran Gorman and Dan Watts who ran twice for juniors teams and to Hannah Gibson and Bethany Halmy who ran for the under 20 girls and the women's open team. Parents Caroline Yarnell, Tony Wong, Fiona McKinlay , Tom Highnam, Michael Halmy, Tom Highnam and John Law ran in 'adult teams' later on, when the course was extremely muddy! Below are photos of about 26 of the 33 juniors who ran. Not pictured at present: Jack Stockeld, Sophie Gocher, Olivia Hogg, Hunter Kelleher, Gus Wong, Ben Jagger and Cam Gorman. 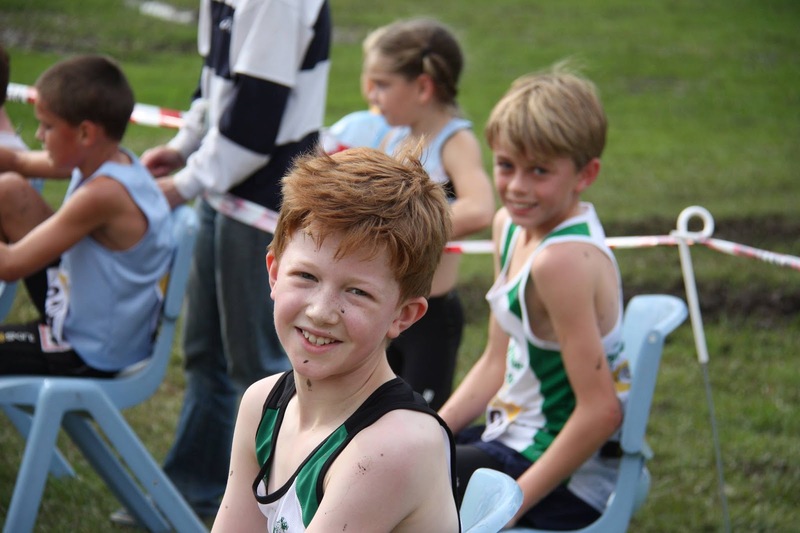 Yes, here's Kieran again, in the under 14 boys team with his brother Liam, Tom Davies and Will Law. Adam Halmy, Paul Loader, David Gardiner and Daniel Francken - our under 18 boys with their silver medals outside the Striders tent. Amelia Gorman, Dan Watts and David Gardiner wait nervously in the changeover are to run last leg of their 3K relays. Two Toms - Kirkland and Davies - sit down to remove their timing chips after the race. 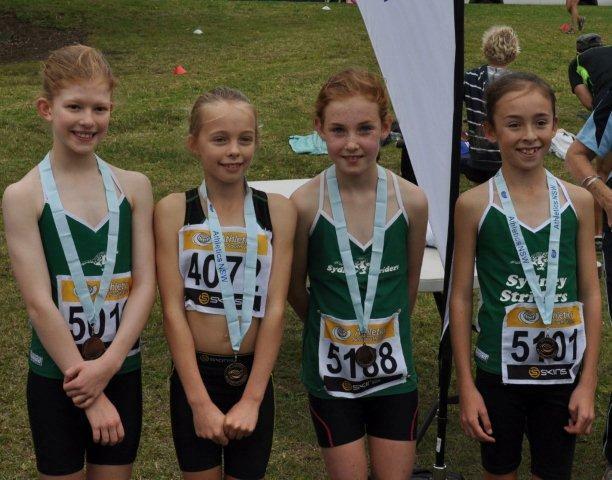 The under 12 girls won bronze with Emma Kirkland, Nicola Hogg, Emily Gocher and Ciara Sinclair. The under 20 girls with their bronze medals - Jess Vernon, Amelia Gorman and Bethany Halmy. Hannah Gibson was also in the team - pictured later on. Hannah Gibson racing past the speed cameras!